At CSN Stores you find a wide and exciting range of products starting from entertainment centres , cookwares, home decoratives and many more.These Entertainment centers are perfect for all your media storage needs and more. Since the television is often the focal point of the room, entertainment centers are also nice to display décor items, such as sculptures, pictures, plants, and books. They have specialists who can assist us in choosing the Perfect entertainment center that caters to our needs.So do visit CSN Stores. 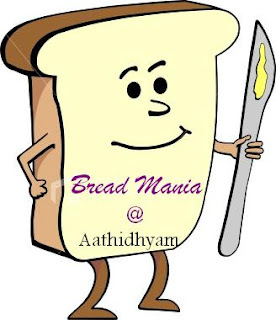 Recently i was contacted by CSN stores, Aathidhyam in association with CSN Stores is giving gift certificate worth 40$ to the winner of this Bread mania event. So let us talk about the event. Bread is one of the oldest prepared foods, dating back to the Neolithic era. Bread is often made from a wheat-flour dough that is cultured with yeast, allowed to rise, and finally baked in an oven. Owing to its high levels of gluten (which give the dough sponginess and elasticity),common wheat (also known as bread wheat) is the most common grain used for the preparation of bread, but bread is also made from the flour of other wheat species, rye, barley, maize and oats. usually, but not always, in combination with wheat flour.Bread white is rich in vitamins (A, B1,B2,B3,B9,B12,K), calcium,iron,magnesium,sodium,carbohydrates etc- source: Wikipedia. Should be a FOLLOWER of my Blog. Provide a link back to this event and use this logo without fail. I am going to choose 2 winners randomly and I will give a Gift certificate worth $ 40 to US residents only. To all my Indian blogger friends,i am going to give a cookbook. 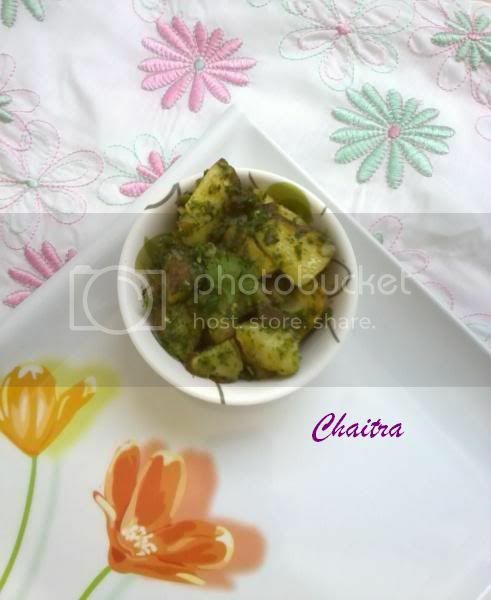 Today i am posting my favourite Green Potato curry~Bangaladumpa Kotthimeera karam. 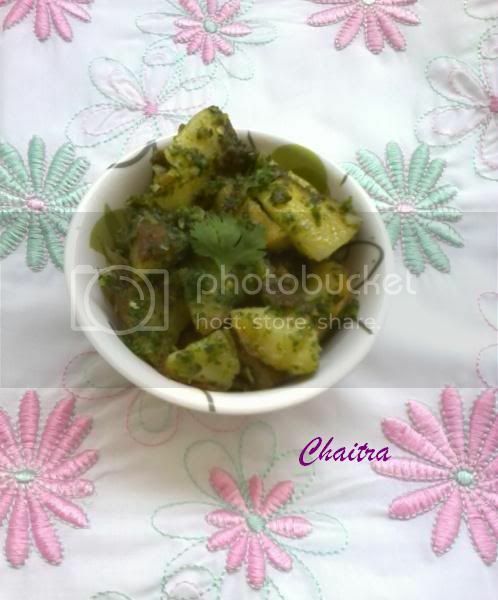 Wash,boil and peel potatoes and cut them unto cubes.Heat oil in a frying pan and fry potatoes until golden brown in colour.Meanwhile grind all the ingredients required for coriander paste including salt & sugar into a smooth paste.Now add this mixture to the fried potatoes in the frying pan.Mix all the ingredients well.Adjust salt if necessary.Off the flame and transfer the contents into a serving bowl.Serve hot with rice. Sending Green Potato curry and Pani puri to Green Gourmet Event hosted by Preethi of Relishing recipes. 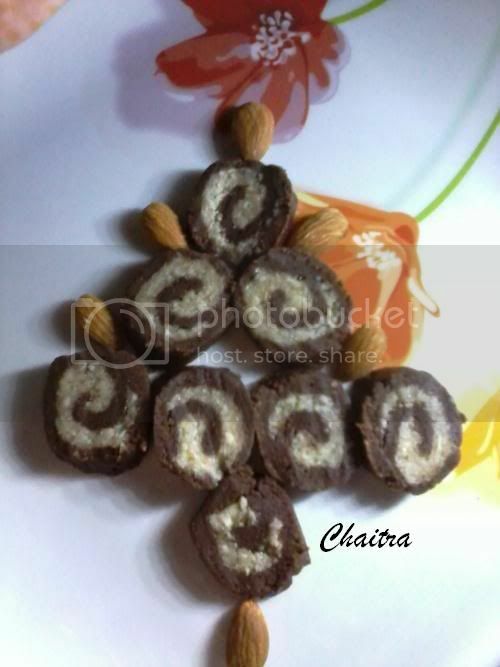 Take a bowl and add powdered marie biscuits, sugar and bournvita.Mix all the ingredients well and add milk as required to make dough(chapathi dough).Keep it aside.Now take another bowl and add all the ingredients required for coconut layer except butter.Mix well.Now add melted butter , mix and make it like a ball.Now roll the choco marie dough flat like chapathi and now place the coconut dough and spread it all over the flattened choco marie dough.Now roll it.Seal the ends and wrap it with silver foil and refrigerate for about 2 hours.After 2 hours,remove and slice them into rounds.Serve them. 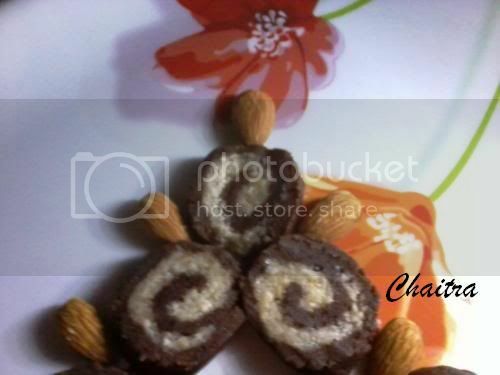 NOTE-Instead of Bournvita,u can use 1 tbsp of cocoa powder. 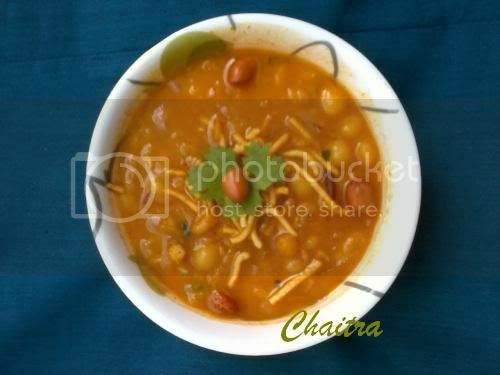 Today i thought of beginning my post with a sweet note but naah....i thought i will treat u with spicier version of Aloo chat all the way from my mom's kitchen. 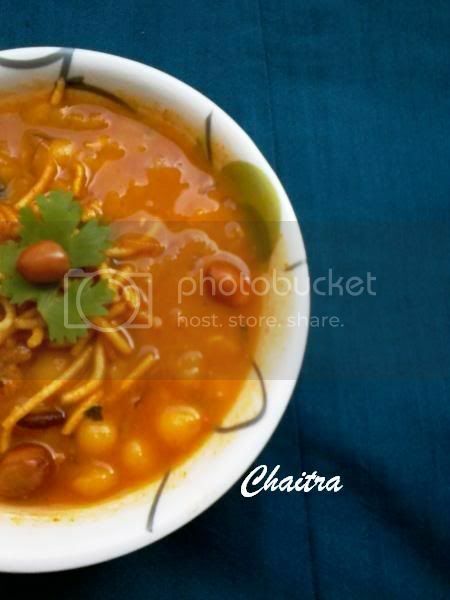 Surely a wonderful treat to all the Chaat lovers! !What do you say??? Soak channa over night and pressure cook until 4-5 whistles.Heat oil in a pan and fry jeera.Gring tomatoes,onions,garlic,ginger and green chilli into fine paste. Now add this puree to the pan and fry till the raw smell subsides.Now add garam masala, red chilli powder, channa masala, turmeric powder and salt.Cook till oil floats on top.Now add mashed potatoes and boiled channa.Cook for 5-10 mins.Adjust salt and then transfer the contents into serving bowl.Finally sprinkle chat masala and garnish with chopped coriander, onions and sev. 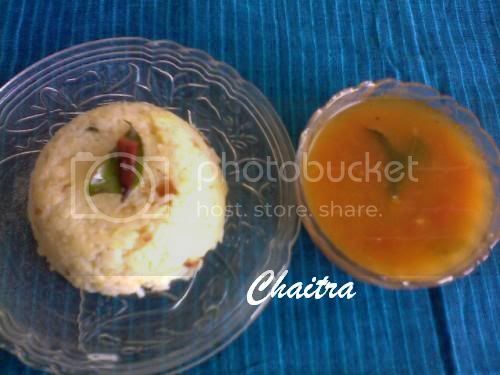 SUGGESTIONS-You can also add pudina chutney, tamarind chutney for variation. You can also add Lime juice. 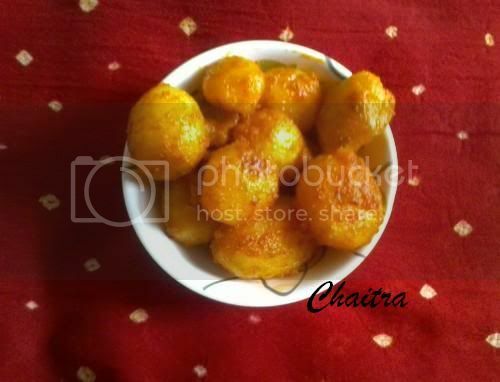 Today i am posting Kids as well as my favourite Potato fry~Banagala dumpa vepudu. Wash,boil and peel potatoes .Heat oil in a cooking vessel and add the baby potatoes .Saute for 3-4 mins, keep stirring this mixture.Now add salt and red chilli powder.Mix all ingredients well.Once the baby potatoes are golden brown in colour, remove excess oil and add besan flour.Mix all the ingredients well and transfer the contents into a serving bowl.Serve it along with rice. 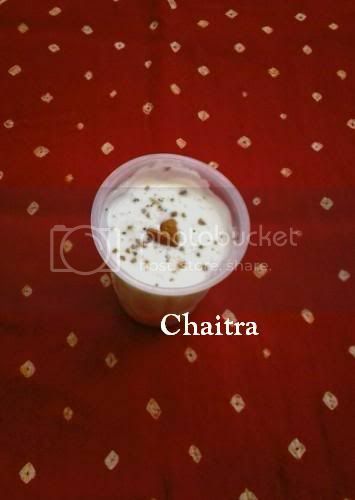 Lassi is a traditional and popular yoghurt based drink originally from Punjab.It is made by blending yoghurt with water,sugar and spices until frothy.It is the best way to beat the scorching heat and to get refreshed.It gives instant energy and cools the body and also promotes digestion.It is also considered as a healthy drink as it is devoid of artificial additives.The flavour can be enhanced by blending with fresh fruits.....Various sources. 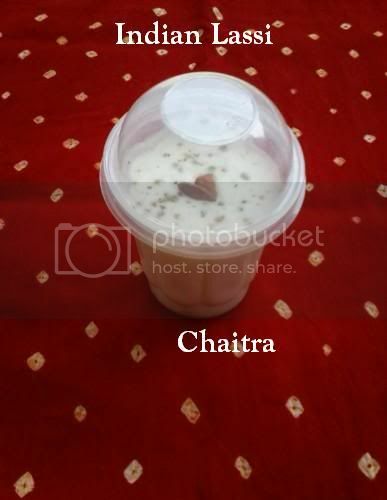 So here comes my favourite lassi in my way. Blend all the ingredients until frothy.Transfer the mixture into a serving glass.Garnish with elaichi powder and almonds.Refridgerate and serve chilled. Note-You can add sugar substitutes instead of sugar. Dry roast moong dal in a heavy bottomed vessel.Now add uncooked rice to it and roast for 2-3 mins.Remove and keep it aside.Now wash rice and moong dal under running water and pressure cook the mixture by adding sufficient amount of water.One you get 3-4 whistles off the flame and cool it.Now heat ghee+oil(or else u can use any one of them) in a heavy bottomed vessel, add all the ingredients required for seasoning and fry for few minutes.Now add the cooked rice mixture to it.Mix all the ingredients well.Add salt water(salt+ water) to ensure proper mixing.Off the flame and transfer the contents into a serving bowl and then serve hot. Heat ghee in a sauce pot and fry mustard seeds,dry red chilly, garlic flakes and curry leaves.After frying add pureed tomato mixture and tamarind pulp.Add salt, sugar and Mtr Rasam powder.Mix all the ingredients well and add water.Cook for 2-3 mins and finally add chopped coriander.Off the flame and transfer it into a serving bowl. 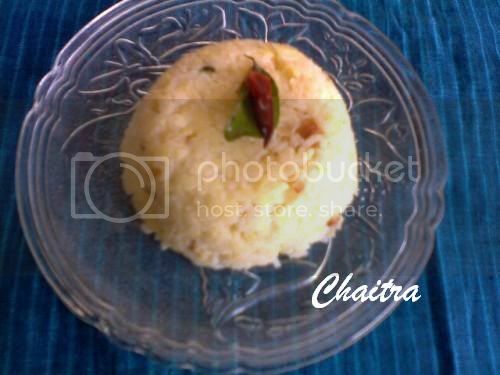 Other names-Pongal,pongali,katte pongali,venn pongal,khichidi,phulagam etc. 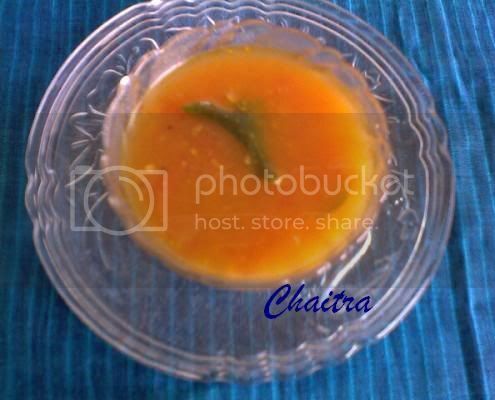 NOTE-Rasam can be served along with plain rice also.